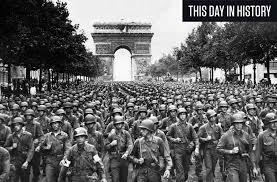 The collapse of the Axis forces continued throughout 1944 with an unparalleled slaughter of millions of troops and civilians. 1. In August, 1944 which military leader resigned? 2. In August, 1944 which two nations that had been allies of Germany made peace terms with the Soviet Union? 3. In October, 1944 which German city was attacked by over 2000 aircraft, one of the largest air strikes in history? 4. In October, 1944 which German officer committed suicide rather than stand trial for his alleged involvement in the plot to kill Hitler? 5. During 1944 Germany used the V2 Rocket as a terror weapon. What country received the most attacks? 6. In October, 1944 what German city was the first to be captured by Allied forces? 7. Who was the U S politician whose plan was to turn post-war Germany into an “agricultural and pastoral nation”? 8. The desperate counter attack staged by the Germans in December, known as the Battle of the Bulge, occurred in what country? 9. In December, 1944 which Allied General was the target of a German assassination attempt? 10. What two month battle (Sept to Nov 1944) of the Pacific War was termed “the bitterest battle of the war for the Marines” by the National Museum of the Marine Corps?